NADS periodically sponsors seminars on specific subjects. 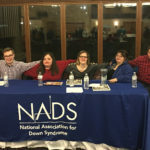 Topics of past NADS seminars have included health-care for children and adults, teaching math to people with Down syndrome, and communication skills. NADS sponsors a conference in Chicago every other year. 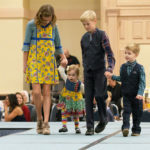 Through this conference, we are able to reach a wide group of people—including parents of children with Down syndrome, therapists, educators, and teens and adults with Down syndrome. Those who attend find numerous opportunities to broaden their knowledge about Down syndrome and their personal network of contacts. Parents learn how best to help their children acquire the skills that will enable them to lead fuller, more independent lives and how to prepare for the transition to adulthood. Teens and adults with Down syndrome learn practical skills which improve their ability to take care of themselves. Professionals learn of new developments in Down syndrome. Our program for families and professionals has two parts: in the morning, we meet as a group for the keynote addresses; afterwards, conference participants can choose from a variety of workshops on specific topics. Our speakers have included authors, educators, doctors, parents, and individuals with Down syndrome. Our workshops cover issues related to each stage of life, from birth through adulthood, and are focused on practical solutions to problems which individuals with Down syndrome might encounter. Many workshops are geared towards parents, but we always include some sessions which are appropriate for professionals. During past conferences, topics for parents have included early development issues, early intervention programs, facilitating language development, inclusion in education, preparing for adult life, and wills and trusts, while topics for professionals have covered subjects ranging from alternative communication techniques to teaching in the inclusionary classroom. While the main conference is running, teens and adults with Down syndrome attend their own sessions. In the past, speakers have included the Medical Director and the Director of Psychosocial Services for the Adult Down Syndrome Center at Lutheran General Hospital; a Nurse Practitioner; a Nutritionist; a music therapist; and a specialist in drama. Presenters teach practical strategies for improving physical and emotional health. The conference also provides opportunities for those attending to socialize together, and part of the day is always reserved for activities which are both educational and fun, such as interactive drama and dancing. By attending the conference, teens and adults with Down syndrome come away with useful information which can help them become more independent in caring for themselves and increased confidence in their ability to do so.